George Orwell reporting for the Ministry of Tru... I mean The BBC. "If Saint Thomas More was the first Englishman, as one historian called him, then Orwell was perhaps the last." Real name Eric Blair, George Orwell (June 25, 1903  January 21, 1950) was one of the most influential authors in the English language. A democratic socialist all his life, but his views changed somewhat over time and his dislike of Soviet communism was very clear. Orwell, a journalist, participated in the Spanish Civil War on the side of the Republicans, serving in the party militia of the P.O.U.M. or Party of Marxist Worker's Unificationnote Note that he didn't care for the POUM's ideology very much - he only ended up in its militia because he had come to Spain via the British ILP, which was affiliated with the POUM. And also because the POUM was against the Soviets, which Orwell already mistrusted., and even got shot in the throat (an experience that he would go on to describe as "interesting"). His works tend to be considered cynical. The term "Orwellian" is named after his famous works of dystopian fiction, particularly Nineteen Eighty-Four.note Which is more than a tad ironic, given that this went against what Orwell himself believed. Homage to Catalonia - an autobiographical account of his experiences in Spain. Down and Out in Paris and London - account of his experiences of poverty in the titular cities. Politics and the English Language - A hugely influential non-fiction essay. Cold War: It is debated whether he actually coined it, but he was certainly one of the first to use the phrase, in his essay "You and the Atomic Bomb". He is also the current mascot for the "Have a Nice Cup of Tea and Sit Down" page. He considered tea to be Serious Business. Spot of Tea, indeed. Badass Biker: Orwell acquired a four-cylinder motorcycle of American manufacture just after his arrival in Burmanote A highly expensive possession for a relatively poor police officer, as most 4-cylinders in the 1920s were more expensive than a Model T Ford and went through several funny adventures while riding it in the Burman countryside . While in Britain he owned a 500cc Rudge-Whitworth motorcycle, which he rode in all weather on the worst roads and abandoned on the Isle of Jura shortly before death. The bike had been rediscovered in 2006 . Beige Prose: Wrote like this himself and advised others to do the same in his essay "Politics and the English Language." Advice included "never use a long word where a short one will do" and "if it is possible to cut a word out, always cut it out." Later writers such as Julian Barnes and Will Self have criticized Orwell, or rather his supporters, for repeating the same advice. They point out that most of the greatest writers of English, such as Shakespeare, Dickens or Lewis Carroll, leave alone James Joyce (who Orwell liked), tended to use all the resources of the English language. Orwell's advice about prose writing was based on his conviction that most writers, including himself, weren't good enough at convincingly using all the resources of the English language, and he thought that if writers who weren't geniuses were going to write at all, then they should aim to write as clearly as possible, and avoid pretentious Latinate words such as "fallacious" when they already had the perfectly useful word "wrong". He wasn't in favour of purging all foreign words from the English language; in the above-mentioned essay, he uses Latinate words such as "consequently", "incompetence", "formation" and "impartiality". What he disliked was the practice of not using a simple and clear but boring word, when you could use a vague and unclear but glamorously foreign neologism. In addition, the essay was not referring to the the literary fiction that the above counterexamples write in, but was primarily aimed at political writing, where such Latinate words are often used to obfuscate a point (such as using euphemisms to obscure talking about a sensitive topic such as war crimes) rather than clarify it. Black and Grey Morality: This is not to say there are no genuinely good people in his stories. However, all his stories seem to go this direction between the protagonists and antagonists. Boarding School of Horrors: Orwell claimed that he attended one, noting how the school structure clamped down on individuality. Later writers stated that Orwell's ideas of totalitarianism was inspired by his time in Eton. His biographer Bernard Crick however stated that Orwell's portrayal of his boarding school life was considerably exaggerated and indeed, Orwell himself often ratted out suspected and actual homosexuals to the prefects, he remained a lifelong homophobe. Capitalism Is Bad: He certainly beloved this, and it's a subtext in most of his works. Crapsack World: Orwell paints a very depressing view of mankind, colonialism, dictatorships, bureaucratism and corruption of revolutions. Dated History: Historian Paul Preston, a specialist on the Spanish Civil War sees his Homage to Catalonia as this. He notes that Orwell's highly polemical and personal involvement with POUM gave people the idea that the Civil War was mainly about intra-left squabbles, and likewise greatly elevated and romanticized the POUM and the anarchists while not giving proper credit to the Communists. Preston notes that the anarchist collective Orwell celebrated was militarily and politically unworkable, and completely against the overall strategic goal of the Republicans (which the Communists under Comintern and Stalin supported) to defeat Franco, and Orwell greatly exagerrated it for his own partisan grudges against fellow leftists. Dead Artists Are Better: Orwell died after finishing 1984. He would become more famous after death and especially as the year 1984 approached. Determined Defeatist: This man was convinced that Stalinism was both infinitely seductive and infinitely mendacious and so the whole world would fall to totalitarianism within his lifetime or shortly after. He also simultaneously believed that mankind is not completely evil and that we should fight for human rights and social justice anyway. Downer Ending: Pretty much all his stories have these. 1984 is a truly disheartening example. Ironically enough, as editor of short stories sent into the Tribune, he openly complained about the tendency in (then) modern writing towards the Downer Ending and the belief that True Art Is Angsty. Orwell: Many readers have told me, in writing and by word of mouth, how tired they are of the kind of story that begins "Marjorie's husband was to be hanged on Tuesday, and the children were starving", or "For seven years no ray of sunlight had penetrated the dusty room where William Grocock, a retired insurance agent, lay dying of cancer"; but I don't fancy they are more tired of them than I am myself, who have to work my way through round about twenty such stories every week. Eponym: Orwellian has become a byword for dystopian futures and totalitarian societies, and use of propaganda. Escaped Animal Rampage: He wrote a short story, Shooting An Elephant about a time when an elephant escaped from a circus and rampaged through a town in Burma. They called him out to kill it. By the time he found it, its rampage was over and it was eating quietly in a field. However, the whole town was gathered round, so he shot it. It didn't die, so he shot it again. Still didn't die. Third shot did it. Well, it took another half hour to die, but it collapsed. 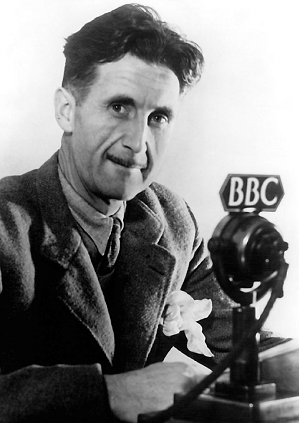 Orwell: I often wondered whether any of the others grasped that I had done it solely to avoid looking a fool. However, it turns out according to his biographer Bernard Crick that this was largely made up by Orwell. According to a Burmese local, there was no escaped animal rampage and Orwell shot that Elephant either for sport or by accident. There was an official government complaint since the Elephant was regarded as valuable government property and Orwell was promptly Reassigned to Antarctica with Colonel Welbourne calling him a "a disgrace to Eton College." His biographer, noted that the essay first appeared in an anthology that encouraged writers to blend fact-and-fiction, though he noted that Orwell never tried to correct the record.note Although Orwell never actually claimed that he was the protagonist of the story either. The Generalissimo: Orwell wrote a lot about totalitarianism and the dangers of such regimes. It's a recurring theme in his entire work. Genius Cripple/Handicapped Badass: He suffered from chest infections all his life, but this never stopped him from writing or serving in the British Imperial Police, the Spanish Civil War (during which he survived a shot in the neck), and the English Home Guard. It led to his early death, however. Hitler Ate Sugar: This trope was pointed out as early as 1944, when George Orwell wrote in What is Fascism? that "It will be seen that, as used, the word 'Fascism' is almost entirely meaningless. In conversation, it is used even more wildly than in print." Orwell names a Long List of often opposing groups accused of fascism. It would seem that, according to Orwell, almost any group at the time had been accused of fascism by linking it to some policy in Fascist Italy or National Socialist Germany. So even at a time when fascism was still a going concern, it already had devolved into being used this way. The Horseshoe Effect: A recurrent theme in both Animal Farm and Nineteen Eighty-Four. Given the increased criticism of the accuracy of his writing, and how Orwell himself took his partisan grudges against leftists to the extent of creating a list of government subversives for the government, one might see his own work as self-demonstrating this effect. Lies, Damned Lies, and Statistics: Orwell was very concerned over the way language could be manipulated by people to justify their means. This was a constant theme in his entire work. Nightmare Fuel Station Attendant: His books are pretty bleak and frightening. Especially Nineteen Eighty-Four. His main thesis was this trope, arguing that everybody, to some extent or other, used totalitarian tactics and "logic" when defending their viewpoints, meaning that even the UK or US could fall to dictatorship one day, and nobody would care. Only Sane Man: Postured himself as the only leftist in all the world to see Stalin for who he truly was. This is probably an exaggeration. Real Life Writes the Plot: All of Orwell's books were inspired by the politics of his lifetime and his fears how society would develop further. Homage to Catalonia was about his firsthand experiences during the Spanish Civil War, Animal Farm was a satire on the Russian Revolution, and 1984 summarized all his fears about Nazism, Fascism and Communism. Of course Orwell could exaggerate "real life" as in the "Shooting the Elephant" essay. Much of 1984 was inspired by his time working as a propagandist for the BBC, and the particular focus on language directed to propaganda use was informed by his time working in the bureau. Animal Farm was inspired by Russian communism and the rise of the Stalin era. Its also based on the vainness of the upper class and the real harsh treatment of the working class. Shooting An Elephant, as already regarded above, was not a faithful rendition of a rogue elephant shooting, but an allegory of the iron fisted politics of the British Empire during the Indian independence movement. Key is the dominant theme, the colonial policeman killing the harmless great beast to save face. This was just the motivation given by Brigadier-General Dyer after the Amritsar Massacre of 1919 : "I considered it my duty to fire on them and to fire well. I think it quite possible that I could have dispersed the crowd without firing but they would have come back again and laughed, and I would have made, what I consider, a fool of myself. (...) They had come out to fight if they defied me, and I was going to give them a lesson." The narrator in Orwell's story uses almost the same phrases. Screw This, I'm Outta Here! : He fled from Republican Spain after the Communists began to suppress opposition. Getting shot in the throat was a definite contributing factor. He wouldn't have been much use in the trenches after such an injury, having almost no voice. Sliding Scale of Idealism vs. Cynicism: Just about all of his works are heavily cynical. Sliding Scale of Libertarianism and Authoritarianism: Orwell himself was firmly down the libertarian end of the scale. At one point in life he apparently considered himself an anarchist, and remained a committed libertarian socialist for the entirety of his life. His settings, on the other hand, are often some of the most nightmarish authoritarian dystopias ever imagined. Unreliable Narrator: Some of Orwell's essays and writings have been regarded as this by later writers. Most notably, Orwell's criticism of his childhood at boarding school has been regarded as unfairly mean and disrespectful to the school headmaster. Julian Barnes has also pointed out that Orwell made several errors in the "Shooting an Elephant" essay, where he sweetened his own role in the stated incident . It is also a fact that the non-Stalinist left existed independently of him, in contrast to what is said at Only Sane Man above.